Last week in chapter 16, Jesus told His disciples exactly what it takes to follow Him. Jesus doesn’t ask anything of us that He isn’t willing to do Himself. First, He will take up His cross for us before He calls us to take up our cross for Him. That’s what it means for Him to be the Christ. It means suffering and dying as the suffering servant predicted in Isaiah 53. But we also have a cross to bear. Jesus calls us to renounce ourselves as our own lords, to stop following ourselves, to deny ourselves. And to take up our crosses, to accept whatever shame and reproach and pain and suffering it will take to be Jesus’ disciple. But it’s the path to glory. Jesus said following Him will be worth it. That He is going to return one day and reward all those who have followed Him. And then the very next story is this one. In Matthew 17. I think these three disciples get a preview of coming attractions. They get a foretaste of what it will be like when the Son of Man comes in His kingdom. We often call this story, “The Transfiguration.” And rightly so. And it’s talking about what happened at the transfiguration to the face of Jesus. Remember, Matthew has just told us that Jesus expects to suffer. That He is going to HAVE TO suffer. He said, “he must go to Jerusalem and suffer many things at the hands of the elders, chief priests and teachers of the law, and that he must be killed and on the third day be raised to life” (16:21). But before they get there, Jesus pulls aside three of His disciples and gives them a little glimpse of His glory. Chapter 17, verse 1. Now, believe it or not, there is a lot to see there in verse 1. First, this “six days” thing. There aren’t a lot of time markers in the Gospel of Matthew, so this may be significant. Most scholars connect up these six days with the six days of Exodus chapter 24. Many Bible scholars have noted the connections between what happens to Moses in Exodus 24 and Exodus 34 with what happens to Jesus in Matthew 17. Does anybody remember what happened to Moses in Exodus 24 and 34? Moses met with God on a mountain. And the glory of the Lord was there. A voice from heaven speaks from the cloud. And those who witness it are struck with fear. And Moses’s face was radiant. It reflected the glory of God. Wait till you see what happens here! Jesus takes these 3 of His closest disciples up on a high mountain. We are not sure which one it is. By the way, Matthew loves mountains. Sometime, go through Matthew and note all of the mountain stories. Why do you think Jesus took 3 disciples? It doesn’t say, but I’m guessing because it take 2-3 witnesses to establish the facts of a matter. These 3 are an inner circle for Jesus that He can be even more intimate with than the 12. And then they can tell this story and give their testimony. Years later, the apostle Peter reflected on this event in his second letter, and he said, “we were eyewitnesses of his majesty” (2 Peter 1:16). Here’s what happened. It’s so amazing. Verse 2. I cannot imagine that was like, and neither can you. The Greek word for “transfigured” is “metamorphothay.” And you can tell what word we get from that! Jesus was changed. Or at least His appearance was. Not His substance. What they got to see was some more of His substance! The veil was pulled back. And “His dazzling appearance display(ed) His deity” (Zondervan NIV Study Bible). 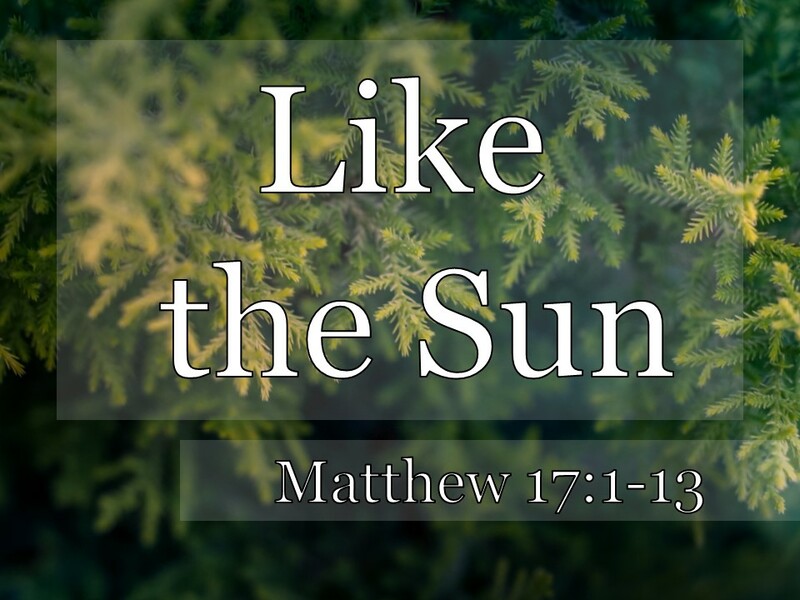 The only thing that Matthew could tell us what it was like to look at Jesus at that moment was like look at the sun. Should you look directly at the sun? You could fry your eye! That’s what Jesus’ face was like. It doesn’t say that it was hot. Just that it was bright. I don’t know if it was His clothes themselves, or if His whole body was shining so brightly that it shone through His clothes so that they were as white as white light. Jesus is always like that, I think, inside. But most of the time, it’s hidden. Jesus says in John 17 that He had glory with the Father before the world began. And this afternoon, you should read the description of Jesus in Revelation chapter 1. John says there that in His vision of the future Jesus’ “face was like the sun shining in all its brilliance” (Revelation 1:16). This moment on this mountain was a review and a preview. It was a review of the glory that Jesus had always had. And it was a preview of coming attractions of the glory of God the Son shining forth like it will again one day. And Peter, James, and John were there to see it. How do we know it was Moses and Elijah? I don’t know. Maybe they had subtitles. Maybe Moses had a couple of tablets and Elijah had his prophetic mantle. Maybe it was just something they knew. It doesn’t say. It does say that there they were having a conference with Jesus. It doesn’t say. But I think a couple of things are obvious. Moses stands for the Law, and Elijah stands for the Prophets. And both of them were forerunners of the Messiah. The Law and the Prophets. That’s like the whole Old Testament together. And here is the Law and the Prophets talking to the fulfillment of the Law and the Prophets. Three tents. Literally, three tabernacles. Why did Peter say this? Matthew doesn’t tell us, but Mark and Luke say that Peter didn’t know what he was talking about. But that never stopped him from talking! He apparently wants this moment to linger. He wants Jesus, Moses, and Elijah to stay together, and not go away. But Peter’s making another mistake. Not just hoping that this moment never ends, but he’s really kind of equating, Jesus, Moses, and Elijah. “One for you, one for Moses, and one for Elijah.” All the same. You guys are equals. He’s not just a prophet. He’s not just another Elijah. He’s not even just another Moses. He is in a class by Himself. I came up with three simple application points for this message. The only proper response to a Person like this is worship. It’s the fear of the Lord. It’s holy reverence and awe. Think about Who Jesus is! Think about all that we’ve seen about Who Jesus is since the beginning of our study in Matthew back in December of 2017. Think just about what it says right here. Yes, God said this before. He said these same words at Jesus’ baptism, remember? That’s why His face is shining like the solar sun (S-U-N). And that Son is glorious and worthy of our worship. All the singing we’ve done today. He is worthy to receive it as worship. But He’s not just glorious. Marvel that God the Father loves God the Son. He is the very definition of beloved. Don’t even try to think about what that means for us. Just think about what that means for them. A eternal relationship of glorious love. And He is perfect pleasing to His Father. I don’t know a little fraction of what that means! I’ve been trying to learn more about what God is actually like. I’ve been focusing some of my reading on His attributes and perfections and His Tri-Unity. And I’ve been realizing more and more that God does not exist for me. I’m glad that He exists. It is good news for me. But He does not exist for me. Or even for us. The Three Persons of the Trinity exist in and for each other. And that’s good news for us because they have no need that they do not fulfill in each other. God has God in God of God. And that’s everything. And that’s good news for us because God doesn’t need us. God isn’t needy. We don’t have to rise to some god-level ourselves to fill in what is lacking in God. There is nothing lacking in God! In fact, God is so full in Himself, that He can freely give Himself to us in salvation. And it causes me to marvel in worship! Whose face shines like the sun. Who talks with Moses and Elijah, the Law and the Prophets. And number two. This one is obvious. If this Jesus is Who the Voice just said, then we probably ought to listen to what He says. I think that builds in Moses and Elijah, right? Jesus is the fulfillment of the Law and the Prophets. Remember that from the Sermon on the Mount? Chapter 5, verse 17. 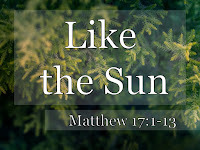 What does Jesus say at the end of Matthew? God wants us to obey Jesus and everything He has told us to do. Some people what Jesus to tell them what to do with their lives. And He will. He loves to guide His people. But He already has told us what to do with our lives. He told us how to live. He told us about living for the inside-out and upside-down kingdom. Jesus is in a class by Himself. Jesus had already explained this to them back in chapter 11, but now the penny has finally dropped. They understand that Elijah was coming so to speak, not just briefly in this conference on this mountain, but in the prophetic ministry of John the Baptist. And His restoring all things was pointing people to the true Messiah, the Christ, the Lamb of God. And, yes, he came, but it wasn’t a happy ending. This same Jesus whose face shone like the sun, is the same Jesus who will die on the Cross. Here He is all light and so is the cloud. A bright cloud, verse 5 said. That’s got to be the Shekinah glory, right? On that day it was all bright light. But on the day Jesus died, from twelve to three in the afternoon, the sun refused to shine. It was dark across the land. Even on this day when the His face shone like the sun, the Son of Man is contemplating the Cross. He’s not just glorious; He’s the Savior. He absorbed all of our darkness to give us His light. This glorious, beloved, well-pleasing Son of God died a cruel, painful, shameful death on a Roman cross for you and for me. And for all who trust in Him and what He did there, there is nothing but blessing and salvation. “He was despised and rejected by men, a man of sorrows, and familiar with suffering. Like one from whom men hide their faces he was despised, and we esteemed him not. Surely he took up our infirmities and carried our sorrows, yet we considered him stricken by God, smitten by him, and afflicted. But he was pierced for our transgressions, he was crushed for our iniquities; the punishment that brought us peace was upon him, and by his wounds we are healed. We all, like sheep, have gone astray, each of us has turned to his own way; and the LORD has laid on him the iniquity of us all” (Isaiah 53:3-6). This One whose face shone like the sun.